1. Put the milk in a medium saucepan and bring to the boil, then pour into a bowl and add the butter; leave to cool to room temperature. Put the flour, caster sugar and salt in a bowl. Stir through the yeast and cocoa, then make a well in the middle of the mixture. Add the milk mixture and the egg; mix to combine. Turn onto a floured surface and knead for 10 minutes (or use the dough hook attachment on a food processor and mix for 5-7 minutes). Put in a lightly oiled bowl covered with lightly oiled cling film and set aside somewhere warm to rise for 1-1½ hours, or until doubled in size. 2. Knock back the dough for about 1 minute, then roll out on a floured surface until about 1cm thick. Cut as many 8cm circles as you can from it, then remove a central circle from each, using a 3-3.5cm cutter (or the base of a large piping nozzle), to make rings. Reserve the central circles; set aside for making extra mini doughnuts. Re-roll the remaining dough and repeat the process until you have 16-18 rings and the same number of mini doughnuts. 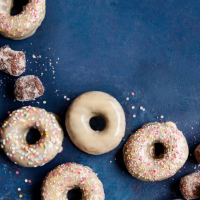 Put the rings and mini doughnuts on a parchment-lined tray dusted with flour, then cover with oiled cling film and leave to rise for another 30 minutes. 3. In a large heavy-based pan, heat the oil to 180°C (use a sugar thermometer to check). Carefully add the ring doughnuts in batches, frying for 1-2 minutes on each side, before removing and putting on a tray lined with kitchen paper. Fry the mini doughnuts for 2-3 minutes, turning halfway through; set aside. 4. To make the glaze, sift the icing sugar into a bowl, then mix in the tahini and 2-3 tbsp warm water, until you have a thick glaze (you may need to adjust this slightly, adding more tahini to thicken, or drops of water to loosen). While the ring doughnuts are still slightly warm, plunge them into the glaze (trying to get it to go down the sides) then put on a wire rack to allow any excess to drip off. Dip into the confetti, 100’s & 1000’s or glitter strands, if you wish. Roll the mini doughnuts in caster sugar to serve. This recipe was first published in Thu Aug 30 15:24:27 BST 2018.